Alaska's national parks offer in unique opportunities to explore glacial and peri-glacial environments, nestled in a wilderness so wild you'll need to arrange for a boat or a plane to get there. Alaska has 24 parks, public lands, rivers, historic areas and preserves which attract nearly three million visitors each year, according to the National Park Service. The Bering Land Bridge National Preserve, located in northwestern Alaska, near Nome, is the eastern remnant of a broad peninsula of land that once connected East Asia and North America. That bridge was the primary pathway used by the original colonists of the Americas some 15,000 to 20,000 years ago. The part that once connected the two land masses is under water, beneath the Bering Strait. Several glacial and volcanic geological features make for a strange landscape within the park, such as the Serpentine Hot Springs, where chimney-like rock formations called "tors" rise to heights of 100 feet. Maar lakes, shallow water-filled craters formed by the contact of magma and permafrost, are ringed by the rough basalt remainders of the explosion which created them. The park has multiple lava fields, remnants of five major eruptions, the oldest of which is Kugurk, which occurred during the Oligocene 26–28 million years ago, and the most recent is Lost Jim, a mere 1,000 to 2,000 years ago. Once home to a variety of now-extinct megafauna (large-bodied mammals) such as mastodons, mammoths, and steppe bison, the tundra is home to reindeer, muskox, caribou, and moose. Historic remnants of commercial whaling, trading and mining industries date to the 19th century, while modern Inupiaq Native American communities recall and respect deeply rooted traditional subsistence and other practices. Denali National Park is named for the Koyukon Native American word for the mountain, meaning "tall" or "high." 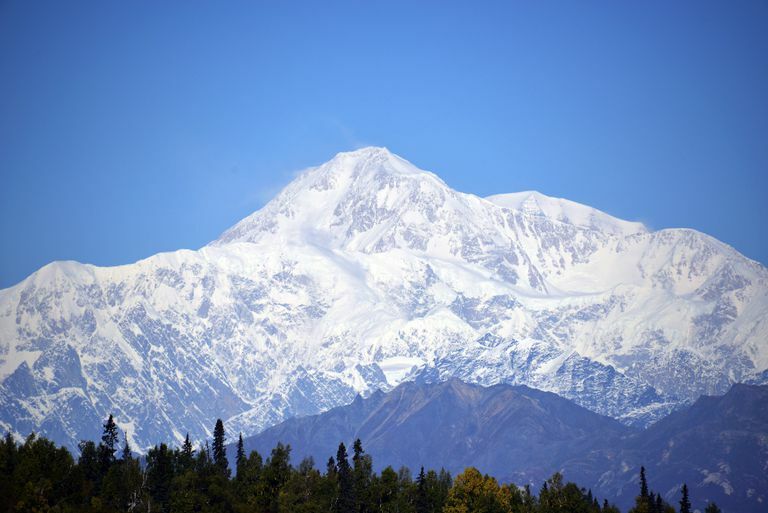 Once named Mount McKinley, Denali is the highest mountain peak in the United States, at 20,310 feet (6,190 m) above sea level. The park, located in central Alaska, contains six million acres, two million of which are designated wilderness, with only one road crossing it. The glacial landscape is home to 39 species of mammals, including moose, caribou, Dall sheep, wolves, grizzly bears, collared pika, hoary marmot, and red fox. At least 169 species of birds (American robin, arctic warbler, black-billed magpie, blackpoll warbler) visit or reside in the park, and there is even one species of amphibian—the wood frog, which can be found across the forests and wetlands of interior Alaska. Fossils in the park were first identified in 2005, and since then, the 70-million-year-old Cantwell Formation has been found so rich in fossils that a complete ecosystem has been reconstructed from this Cretaceous Period rock. Denali has a canine ranger force, made up of sled dogs who have played a huge role in protecting and preserving the unique wilderness character of this park since 1922. Originally used for patrolling the boundaries against poachers, today the dogs perform essential and inspiring work for preserving the unique character of the park; their kennels are open to visitors. Gates of the Arctic National Park and Preserve, located above the Arctic Circle in north-central Alaska, near Battles, was named by wilderness advocate Robert Marshall, who traveled the North Fork Koyukuk country frequently from 1929 to 1939. Marshall called two peaks, Frigid Crags and Boreal Mountain, "the gates" which marked the opening of Alaska's central Brooks Range into the far north Arctic. The park includes steep mountains between 4,000–7,000 feet above sea level, crisscrossed by six national wild rivers. From November to March, the park is closed while temperatures stay between -20 and -50º F; dog sledders return in March and backpackers in June, when the ice frees up the rivers. There are no trails or visitor services in the park at all. There is, however, a permanent Nunamiut Inupiat village in the park called Anaktuvuk Pass. The town of 250 people has regular air service, a village store, and a museum that highlights Nunamiut history and culture. The people rely on reindeer herds—the Gates of the Arctic preserve part of the enormous Western Arctic Caribou Herd—but they also hunt Dall sheep, ptarmigan and waterfowl, and fish for trout and grayling. The Inupiats also trade for food resources from the Arctic coast like meat and blubber from seals and whales. Glacier Bay National Park and Preserve is located in the panhandle region of southeastern Alaska, and it includes 3.3 million acres of rugged mountains, living glaciers, temperate rainforests, wild coasts, and deep sheltered fjords. The park is a laboratory for glacial research. It features a 250-year documented history of the glaciers, beginning in 1794 when part of the glacier was 4,000 feet thick. The environment is alive, continuing to adapt to landscape changes following deglaciation, allowing visitors and scientists to observe plant succession in progress. Lands near the mouth of the bay were permanently freed from ice around 300 years ago, and have lush spruce and hemlock forests. More recently, deglaciated areas feature fast-growing deciduous forests of cottonwood and alder, which give way to shrublands and tundra, until up near the glaciers where nothing grows at all. The park was made famous by naturalist John Muir, who visited the region multiple times between 1879 and 1899 and described the glacial landscape in essays, articles, and books such as "Travels in Alaska." His evocative writing made Glacier Bay a magnet for tourists and scientific research beginning in the late 19th century. Katmai National Park and Preserve, at the northern end of the Aleutian islands, features geology that changes dramatically along an east-west axis. The gently sloping western side of the park contains many glacial moraines that have dammed rivers and streams, helping create the large lakes that are characteristic of western Katmai. The landscape here is also pocked with smaller kettle ponds, where water fills the depressions left behind by large blocks of ice from the melting glaciers. 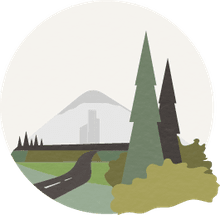 On the east side, Katmai is part of the "Ring of Fire," a zone of earthquakes and volcanoes that surrounds the Pacific Ocean, and there are at least 14 active volcanoes within park boundaries. The three most recent volcanic eruptions include Novarupta-Katmai (1912), Mount Trident (1953–1974), and Fourpeaked Volcano (2006). Novarupta was the world's largest volcanic eruption of the 20th century, and one of the five largest in recorded history. That eruption created the "Valley of 10,000 Smokes," laying down thick layers of ash and pumice, interrupted by pyroclastic flows and surges that moved at more than 100 miles per hour. The ash took decades to cool and vents from the super-heated steam became fumaroles. Today, the valley offers a landscape of beauty, wildness, and mystery. Kenai Fjords National Park is located in south-central Alaska, on the north Gulf coast south of Anchorage. Nearly 40 glaciers flow from the Harding Icefield within Kenai's boundaries, supporting wildlife which thrives in icy waters and lush forests. Over half of the park is covered by ice today, but all of it was once ice-covered, and the landscapes bear witness to the movements of the glaciers. The park maintains an extensive museum collection of more than 250,000 objects, representing the history of the area, including a focus on the Sugpiaq people who nurtured a life entwined with the sea. Kenai Fjords is at the edge of the North Pacific Ocean, where storm patterns develop and feed a land of ice: Stunning fjords, moraines, outwash plains, U-shaped valleys, meltwater rivers and streams with wide rocky beds. Nearly 200 species of birds have been documented in the park, such as the bald eagle, black-billed magpie, black oystercatcher, marbled murrelet, peregrine falcon, puffins, and Steller's jay. Many pelagic (open sea) birds can be found in the waters or nesting on or near the park. The harbor provides a home to several threatened species, such as humpback, gray, and sei whales, and Steller sea lion. Kobuk Valley National Park, located above the arctic circle in northwestern Alaska, near Kotzebue, contains a wide bend in the Kobuk River called Onion Portage. There, archaeologists have found evidence that the Western Alaskan Caribou Herd has been crossing the river there during their annual migrations for 9,000 years or more. Today, the Inupiaq Native Americans recall their caribou hunting past and still get part of their subsistence from the caribou. One of Kobuk Valley National Park's most iconic sights is the Great Kobuk Sand Dunes, rising unexpectedly out of the trees along the southern bank of the Kobuk River. The 25 square miles of shifting golden sand in dunes reaching 100 feet make up the largest active sand dunes in the Arctic. Sparse grasses, sedges, wild rye, and wildflowers grow in the shifting sand of the dunes, stabilizing it and paving the way for a succession of mosses and algae, lichen and shrubs, the next steps on the evolutionary way to recovering from receding ice. Lake Clark National Park and Preserve, in south-central Alaska, near Port Alsworth, can only be reached by plane or boat. The east side of the park features the mountainous terrain of the Chigmit Mountains, with rugged peaks and spires, glaciers, and snow-clad volcanoes; the west is a post-glacial environment of braided rivers, cascading streams, waterfalls, and turquoise lakes, set in environments of boreal forests and tundra. Lake Clark was the ancestral homeland of the Dena'ina people, who first came to the region about the end of the last Ice Age. Others who have lived in this region include Yup'ik, and Sugpiaq Native American groups, Russian explorers, gold prospectors, trappers, aviators, and American pioneers. Quk' Taz'un, 'The Sun Is Rising,' is a Dena'ina outdoor learning camp that encourages youth to engage with Dena'ina history and culture. Through language classes, archaeology, and traditional crafts, the camp passes cultural knowledge to future generations. The Noatak National Preserve, located above the Arctic Circle and adjacent to the Kobuk Valley National Park, is dedicated to the Noatak River, a national Wild and Scenic River, which starts in the Brooks Range and empties in the Chukchi Sea 280 miles west. The Noatak River basin is one of the world’s finest remaining vast wilderness areas, and it has been named an International Biosphere Reserve. The preserve lies almost completely enclosed by the Baird and DeLong Mountains of the Brooks Range, near where the boreal forest ends, merging into treeless tundra on the valley’s southern edge. Hundreds of thousands of caribou cross this broad expanse, migrating to and from calving grounds. In addition to protecting the Noatak River valley and adjacent lands, the preserve also serves to protect the fish, wildlife, waterfowl, and archaeological resources within its boundaries. Wrangell–St Elias National Park and Preserve is on the eastern border of Alaska, near Copper Center at the top of Alaska's panhandle. Its boundaries were once the home of four distinct Alaskan Native groups: The Ahtna and Upper Tanana Athabascans resided in the interior of the park, and the Eyak and Tlingit lived in villages on the coast of the Gulf of Alaska. The park has a broad diversity of sub-arctic plant life, covering three climatic zones (maritime, transitional, and interior) within its boundaries. Much of the park is boreal forest (or "taiga"), an ecosystem which consists of mixed spruce, aspen, and balsam poplar forest interwoven with muskeg and tussocks. The ecosystem is influenced by the geologic processes that created the park and is home to caribou, black bear, loon, lynx, and red fox. The Yukon–Charley Rivers National Preserve lies on the eastern border of Alaska, east of Fairbanks, and it includes all 106 river miles of the Charley (a tributary of the Yukon) and its entire 1.1-million-acre watershed. The basin of these two great rivers within the preserve provides a habitat for one of the largest breeding populations of peregrine falcons in North America. Unlike most of the other national parks in Alaska, less than five percent of the preserve was ever glaciated, meaning that most of the geologic and paleontologic records are not buried under glacial debris. Much of geologic history (Precambrian era to the Cenozoic) is preserved and viewable within the park's boundaries. Alpine tundra communities occur in mountainous areas and along well-drained rocky ridges with vegetation of mat-forming heather. Sparse islands of cushion plants, such as moss campion and saxifrage, are interspersed with lichens, willows, and heather. A moist tundra is found in the foothills, with cotton grass tussocks, mosses and lichens, and grasses and small shrubs such as dwarf birch and Labrador tea. Those environments support wolves and peregrine falcons, passerines, and ptarmigans, arctic ground squirrel, brown bear, Dall's sheep, moose, and snowshoe hare. Between 2012 and 2014, shale outcrop formations in the park spontaneously ignited, causing the "Windfall Mountain Fire," a rare phenomenon.